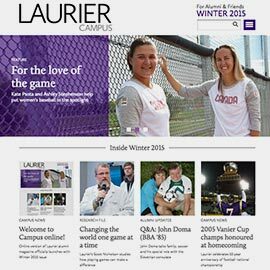 Laurier Campus, Wilfrid Laurier University's official magazine for alumni and friends, has a fresh new digital presence! The Winter 2015 edition of Campus marks the launch of campusmagazine.wlu.ca, the exciting new online version of the magazine. In launching this vibrant web edition, Campus will be available to a wider audience while offering readers exciting online exclusives such as video, additional photos and information, interactive graphics and much more. Meant as a complement to the print version of the magazine, campusmagazine.wlu.ca will bring readers the same compelling stories found in each issue of Campus along with exclusive online-only content delivered in a more accessible and engaging digital format. The web version will be fully responsive, allowing readers to view each issue on their desktops, laptops, tablets and smartphones. It will also give Laurier alumni and friends greater opportunities to share stories about the university and its graduates via social media. The new web version of Campus magazine is not intended to replace the print version entirely. However, in an era of environmental and cost sensitivity, we are trying to reduce the number of copies that we print and mail each issue. If you currently receive a print edition and would like to go paperless, receiving Campus magazine only online, please let us know by emailing alumni@wlu.ca or calling 519-884-0710 x3180. We will remove your name from our print mailing list and send you an email each time a new online edition of Campus is published. Regardless of which format you choose, we’re confident that you will continue to find Campus magazine a great way to stay connected to Laurier.